How Do I Force the Play Store to Ask for My Password for Every Purchase? By default, after you sign in on a device, the Google Play Store only asks for your account password the first time you make a purchase and allows you to make purchases for 30 minutes without re-entering your password. While this feature is helpful when you buy apps in bulk since you do not have to re-type your password every time you buy an app, it could potentially lead to several unauthorized purchases if someone else uses your phone within that 30-minute time frame. Here is how you can prevent this from happening. Your card could potientially be emptied quickly if your child has access to your phone soon after you buy something from the store. Since mobile games are filled with in-app purchases, your child could buy items using real money without your password. You probably do not want this to happen to you because many in-app purchases cost hundreds of dollars. 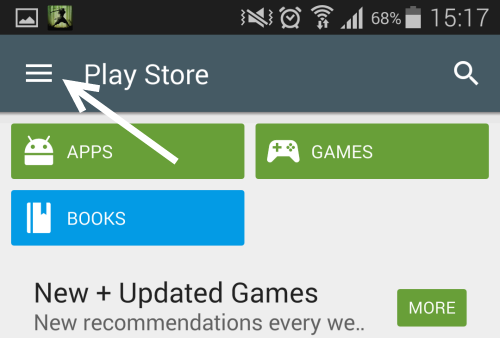 This guide works for any device that has Google’s Play Store installed. 1. Open the app drawer, and launch the Play Store app. 2. If the Play Store app opens in app detail view, press the back button repeatedly until you get to the home view which has an overflow icon like the one in the picture. Tap that icon to access the app’s menu. 3. In the slide-out menu, choose Settings. 4. Under the User Controls section, you will find an option called Require authentication for purchases. By default, it is set to Every 30 minutes. 5. If you tap that option, a small window will appear on-screen, allowing you to change the setting. To prevent potential unauthorized purchases, change the setting to For all purchases through Google Play on this device. It is recommended that you do not set it to the Never option. 6. From now on, the Play Store will always ask for your account’s password whenever you or someone else downloads a paid app/game.